Maumee, OH, January 16, 2019 – Aktion Associates, Inc., national software reseller and IT infrastructure provider focused on the Construction, Distribution and Manufacturing industries, announced it has been selected as a member of the Bob Scott’s VAR Stars for 2018, a group of 100 organizations honored for their accomplishments in the field of midmarket financial software. Members of the VAR Stars were selected based on factors such growth, industry leadership and recognition, and innovation. Selection is not based on revenue and those firms chosen represent a wide range of size and many different software publishers of accounting software. “We appreciate being included on this prestigious list again,” said Aktion CEO Scott Irwin. “2018 was another significant growth year for the Aktion team. I credit our ongoing success to delivering what customers want, which is choice. Every customer is unique. They want to choose the software, choose the licensing and choose the deployment. We offer exactly that — industry-specific software, licensing and deployments options, all supported by skilled technology professionals who deliver outstanding customer service. It’s what sets Aktion apart from other VARs,” Irwin added. 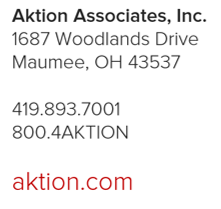 Aktion Associates Inc., is a national software reseller and IT system integrator focused on the Construction, Distribution and Manufacturing industries. With more than 4,800 customers in the US, we partner with innovative technology providers to deliver vertical-specific business applications to our clients including, Accounting, Estimating, ERP, Project Management, Service Management, eCommerce, Mobile, Analytics/Reporting, HR/Payroll, Document Management and Inventory. Company-owned data centers provide secure Cloud/Hosting, Disaster Recovery and Back up Services, and the Network Operations Center ((NOC) monitors/supports Managed Services clients in real-time. Aktion is an IT infrastructure provider for IBM, HP, Lenovo, Cisco, VMware and Microsoft technologies. Other deliverables include Network Engineering, Software Engineering and on-premise IT support. Bob Scott has been informing and entertaining the mid-market financial software community via his email newsletters for 19 years. He has published this information via the “Bob Scott’s Insights” newsletter and website since 2009. He has covered this market for more than 25 years through print and electronic publications, first as technology editor of Accounting Today and then as the Editor of Accounting Technology from 1997 through 2009. He has covered the traditional tax and accounting profession during the same time and has continued to address that market as executive editor of the Progressive Accountant since 2009.